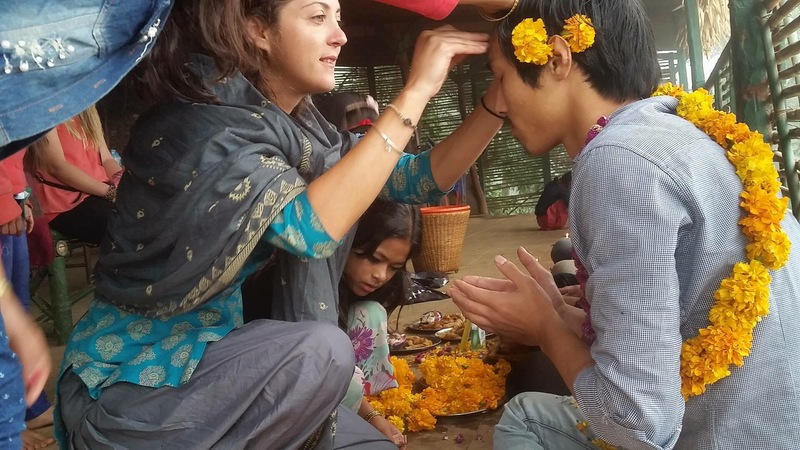 Tihar was celebrated over 5 days in Nepal. It’s an important festival where not only humans and gods are celebrated but also animals. Day one – the day of the crows. The cawing of crows symbolizes grief and sadness. Food is offered to the crowd to avert death in their homes. I was told the following story by my Nepali friend… The God of death sent Amrit (the nectar which makes anything immortal) he took that and came to earth and wiped its beak on the grass which never dies. This is considered the immortal plant. Day two – the day to worship dogs (khukur). Devotees put garlands, tika and offer food to their dogs to acknowledge the relationship between dogs and humans. Day three – day to worship cows and goddess of wealth Laxmi also known as Diwali. The cow represents prosperity and wealth and is fed the best grass this day. Houses are cleaned and Windows and doorways are lit up with candles and garlands to welcome goddess Laxmi. This day girls and ladies sing and dance moving from home to home. Their audience gives the performers some money presented its some tika in a bowl of rice. 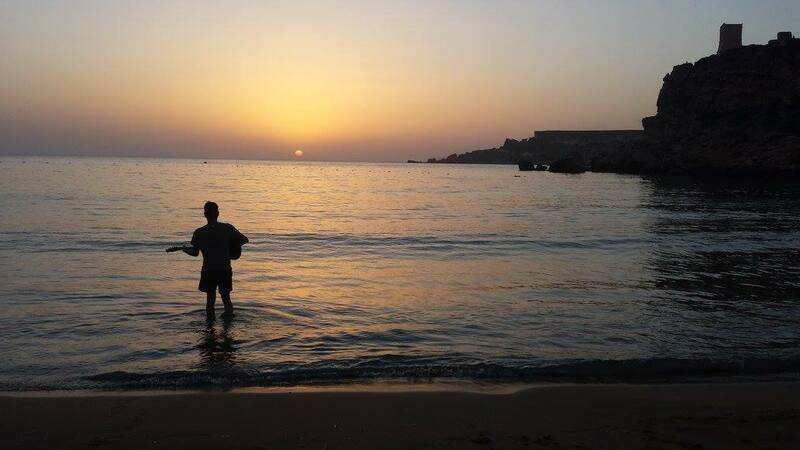 Day four – this day is celebrated differently according to region and culture. Most often the Ox is celebrated. Some others worship their vehicles or other possessions or even themselves! Confusing..! Day five – baitika blessing of brothers and sisters – my favorite day of the festival. Sisters put tika on their brothers to wish them a long life and thank them for the protection that they provide. 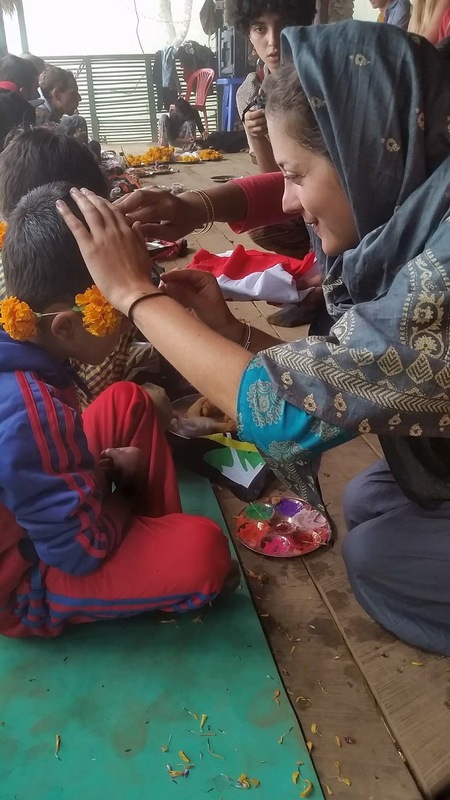 Sisters make special garlands, feed their brothers special food and sweets, exchange gifts, put tika on their foreheads and enjoy the day together. It’s a symbol to strengthen relationships also. 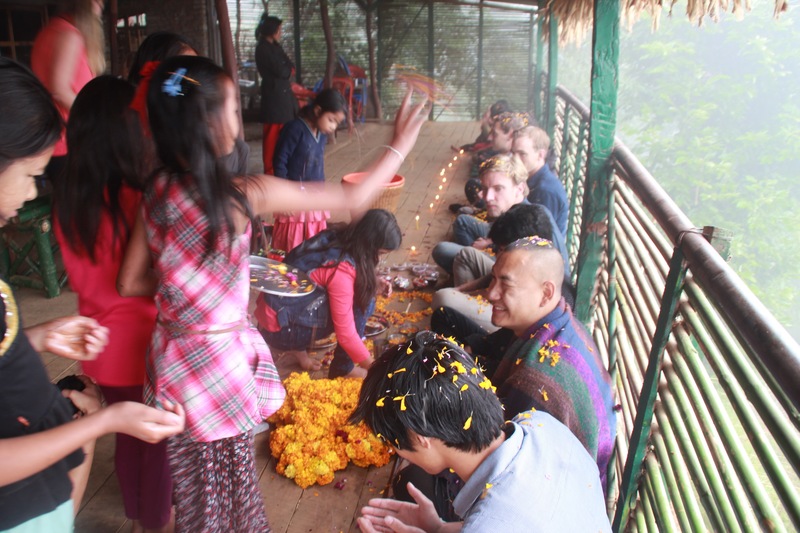 I celebrated Tihar with our hostel kids, volunteers and locals in chisopani village. Each day groups of people would come to our school to dance and sing. 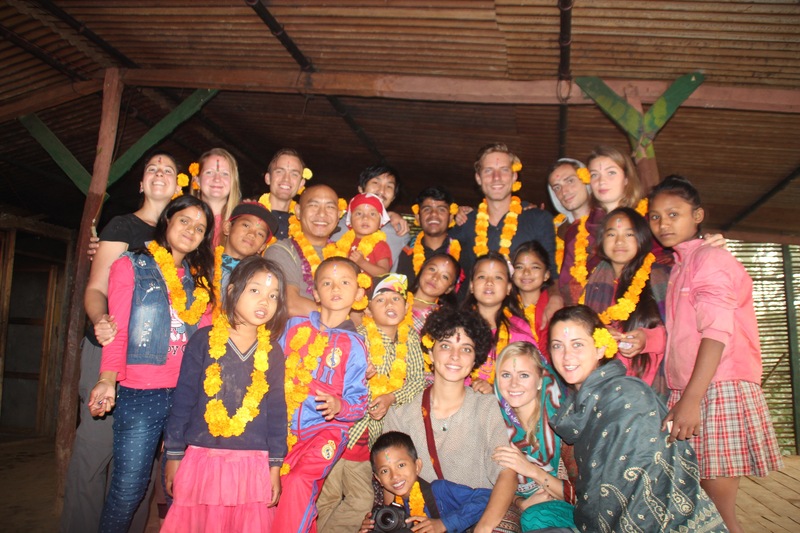 One the first night our hostel kids also went round some villages dancing and singing. I accompanied them together with some other volunteers. They hung the solar panel battery on a long bamboo stick and carried a really loud speaker everywhere. They danced and sang waking up many households. The group then receives some money presented on a plate of rice and a candle. On Diwali, homes lit up beautifully with candles. 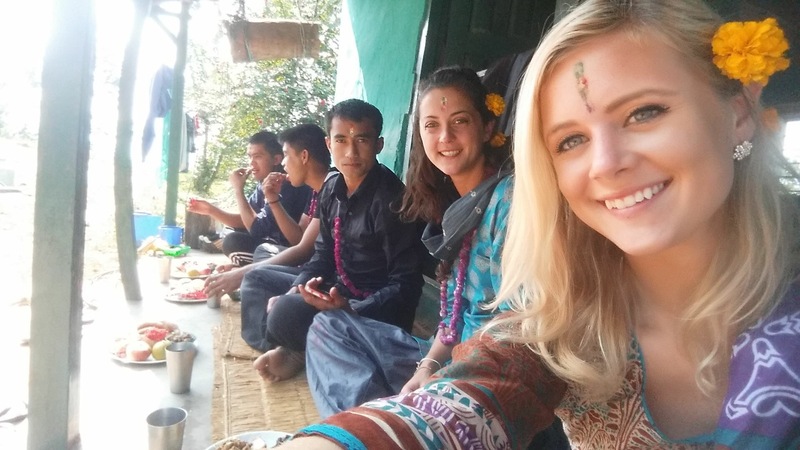 On this day the children also prepared beautiful mala necklaces for the following day and spent a whole evening by an open fire making roti – a sweet deep fried dough. Putting tika on Ujwal, hostel student. It was a special morning. We all got up early and dressed nicely. Everyone was looking so pretty. I wore my new kurta – typical Nepali outfit – which I had made recently by Dilu Maya, a girl that lives in the village. Each boy received tika, blessings, food and a mala bead. Then the boys also did the same for the girls. It was so well organized mostly by Yoon and the kids. Later that morning I was invited to the down shop by Anita Nani. She was putting tika on her brothers and cousin. A beautiful experience and so grateful that she included me for this. Miranda and I joined the boys for some food: chicken, spinach, roti and some other items. The village was vibrant. I’ve never seen it to be so full of life. I joined some volunteers at village homes for some raksi and nibbles. Memories I will never forget! An experience many others should experience.